UNISON has welcomed the launch of a two-year, Europe-wide campaign aimed at helping companies alleviate the impact of work-related stress. The ‘Healthy workplaces manage stress’ campaign was launched in Brussels by the European Agency for Safety and Health at Work (OSHA). According to an OSHA poll, stress is the second most frequently reported work-related health problem in Europe. More than half of all workers who responded to the poll considered work-related stress to be common in their workplace. Four in 10 thought that stress was not handled well in their organisation. The most common causes of work-related stress were job reorganisation or job insecurity, working long hours or excessive workload, and bullying or harassment at work. 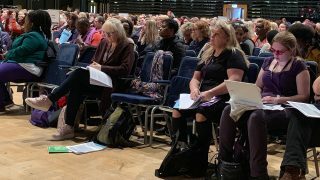 The campaign will involve hundreds of organisations from across Europe, and a range of activities such as training sessions, conferences and workshops, advertising campaigns and press conferences. 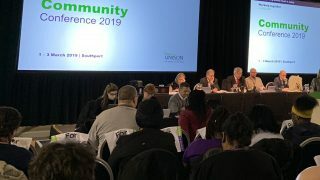 The OSHA campaign chimes with UNISON’s “cut stress, not jobs” drive, launched last autumn as part of the union’s health and safety campaigning. 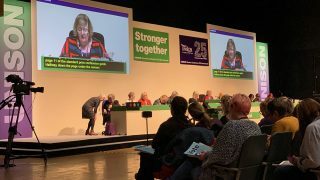 “We are pleased that OSHA recognises the impact stress can have on workers’ lives,” said UNISON head of health and safety Tracy Harding. Branches can order “cut stress not jobs” material, including leaflets and stickers from the online catalogue. 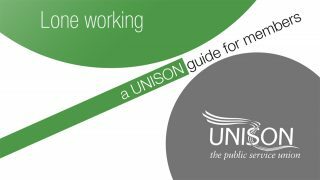 The union will also be producing additional materials in time for European Health and Safety Week, beginning 20 October.